The U.S. Air Force plans to launch a $226 million mission aboard a Minotaur rocket Tuesday to reshape how deployed forces receive battlefield imagery from space, a breakthrough in the Pentagon's program to field tactical satellites on smaller budgets and faster schedules. The Minotaur 1 rocket stands ready for launch from Wallops Island, Va. Credit: Thom Baur/Orbital Sciences Corp. The Minotaur 1 rocket, partially composed of decommissioned Minuteman missile stages, is scheduled to ignite and soar into space at 8:28 p.m. EDT Tuesday (0028 GMT Wednesday) from pad 0B at the Mid-Atlantic Regional Spaceport, a commercial facility located on the grounds of NASA's Wallops Flight Facility on Virginia's Eastern Shore. The launch window extends for three hours, according to NASA and Air Force officials. But there is a 70 percent chance weather could violate preset rules and force a delay. After accelerating into orbit on the power of four solid-fueled rocket motors, the Minotaur launch vehicle should release the ORS 1 spacecraft 248 miles above Earth less than 12 minutes after liftoff. Officials postponed the launch from earlier this year to ensure the Minotaur does not suffer the same fate of a Taurus rocket that failed to jettison its nose cone a few minutes after liftoff in March. A NASA climate research satellite was lost in the March mishap. Although the rockets are different, they share a similar separation system in the payload fairing, a clamshell-like structure that protects the satellite during the early phases of launch. Once the rocket is above the dense lower atmosphere, the shroud is released to jettison weight. Orbital Sciences Corp., the contractor for the Taurus and Minotaur rockets, completed its investigation into the March launch failure, according to Lou Amorosi, Orbital's vice president for the Minotaur program. "They found a design susceptibility in the fairing separation system," Amorosi said. "That is the most probable cause of the failure, and that susceptibility was demonstrated through ground testing. We did do similar testing on Minotaur because we do share some components with Taurus, and what we found is the Minotaur is much less susceptible to this issue." But "to be absolutely safe" in the wake of the Taurus mishap, Amorosi said Orbital recommended making minor modifications to the Minotaur rocket to ensure the ORS 1 mission is not struck by the same anomaly. The Air Force agreed with the changes, which included a software and a mechanical modification, according to Amorosi. The ORS 1 satellite is the first operational platform to be fielded by a military division chartered to reduce the costs and timescales of deploying payloads to supply forces with tactical intelligence and reconnaissance imagery. The Pentagon calls the initiative Operationally Responsive Space. The unit is headquarted at Kirtland Air Force Base, N.M.
ORS 1 will deliver tactical surveillance and reconnaissance imagery directly to U.S. troops on the battlefield. U.S. Central Command requested the space-based imaging capability for its operations in the Middle East, North Africa and Central Asia, including Afghanistan. "The satellite is going to provide imagery of the CENTCOM area of operations," said Peter Wegner, director of the ORS office. "You may ask what's so special about that? Point No. 2 is the way we're providing this capability is very unique." From the perspective of CENTCOM commanders and forces in war zones, the ORS 1 satellite will seem like just another airborne drone. "In a sense, what we did is we built this satellite so that it looks very much like an airborne sensor to the operators at Central Command," Wegner said. "It's the very same computer and software systems that they use to task airborne imagery systems." ORS 1 carries an imaging sensor derived from the SYERS 2 camera flying on the Air Force's U-2 spy plane. Like the U-2 sensor, the ORS 1 instrument was built by Goodrich Corp. and installed on the satellite at the company's facility in Danbury, Conn.
"I think the one big difference between this satellite and other satellites you're familiar with is that it's a tactical satellite," said Thom Davis, the ORS 1 mission manager. "And it supports CENTCOM very similarly to the airborne assets. They will use it to augment the support they normally get from the U-2s, the UAVs and other airborne platforms." Goodrich also supplied a ground system to format the satellite imagery for incorporation into existing processing software and dissemination networks. 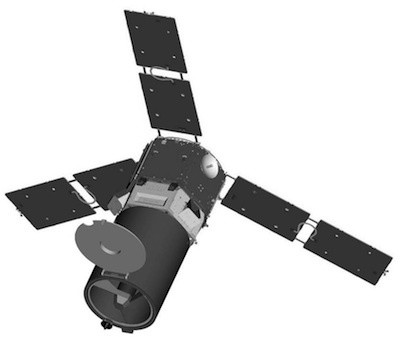 Military officials speaking June 24 did not disclose the imaging resolution of the SYERS sensor aboard the ORS 1 satellite, but the instrument's telescope could spot objects as small as 4 feet across, according to previous statements by engineers familiar with the project. "The system does allow you to take images of objects around the world," Wegner said. "It will give those deployed service members awareness of what's going on around them, what kind of vehicles and what other things may be happening around them." 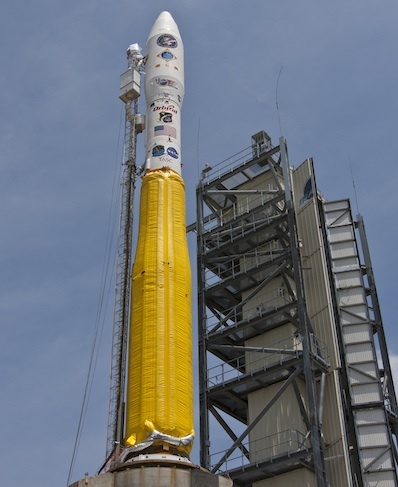 Developed and declared ready for launch in 30 months, the ORS 1 mission is breaking the paradigm of military space programs, which are prone to high costs, long development cycles and strict requirements, officials said. The Pentagon established the ORS program to develop tactical satellites with a single mission. After launching two demonstration satellites, TacSat 2 and TacSat 3, the ORS office received orders to build an operational spacecraft in 2008. CENTCOM commanders delivered a notice of an "urgent need" in late 2008 for an imaging satellite designed to serve troops on the battlefield. "That started the ORS 1 mission just a little over two-and-a-half years ago, and in a very short time, this team has done something pretty incredible," Wegner said. The satellite bus was manufactured by ATK in Maryland in 17 months, according to Brendan Regan, the company's vice president of space mission systems. Then the spacecraft was shipped to Goodrich's plant in Connecticut to receive the SYERS telescope and camera. Col. Carol Welsch, the Air Force's ORS 1 mission director, said ground controllers plan a 30-day checkout phase before handing control of the craft over to the 1st Space Operations Squadron at Schriever Air Force Base, Colo.